06/01/2008: Photos is finally linked into the main page! W00t! Photos! 03/29/2007: Phone Reviews has been replaced with a new reviews subdomain! Check it out! 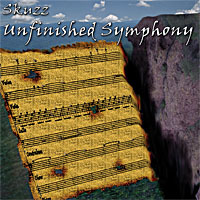 09/16/2006: Unfinished Symphony is being released at my album release party on 9/16/06! Album release is also on the web site as of now! It took me a few years to finish this one, but it was worth the wait! Find it here! GARRR YOU CAN'T HEAR ME!